Re: Anybody Click On The HTP Site Lately? Thanks for the link Hank. Hope you've got some sunny weather & are enjoying your vacation. I understand the problem well I have had my Pacific story ripped off several time that I know of. I have also had people ask me for permission for a photo or too and have always said yeas if they ask. I have an idea: why not make the site private? Put forward a criterea that users have to be members of the forum in good standing with at least 20 posts (or something similar)? Ebough that the moderators can get to know you. If you want more, then make users sign a further non-disclosure agreement? I still don't understand why people make such a big deal about pictures? Who cares. They are pictures. You aren't going to get rich and famous from them. Anything I do online, I already KNOW it is no longer my property. Who cares who takes my pics and comments. Just glad somebody can use them. Have at em. I agree and think most members here would also agree. We do a good job of crediting the proper owner when sharing someone else's shot though, so that isn't the problem. Also Walt even if your pictures aren't watermarked, it's still your legal property and you have the right to claim it as such if you find someone else presenting it as their own. Don't be afraid to fight for your rights. I don't mind people sharing my photos, or enjoying it on their own, but when they start sharing it and presenting it as their own is when I have a problem. 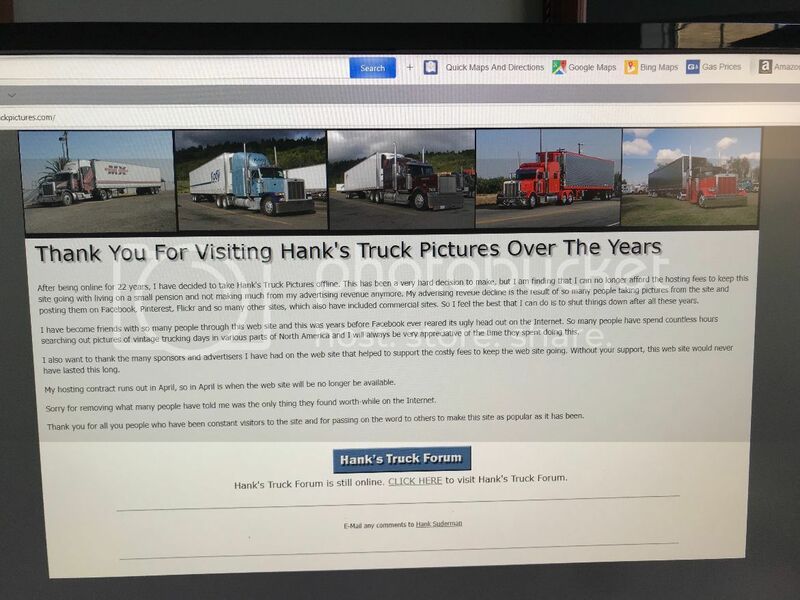 Kudos to Hank for reinstating the Hanks Truck Pictures website as of today. Thank you thank you thank you Hank. Great to see the photos back again for everyone to look at & have a peek at the history of the trucking industry. Good eye Charlie, I have to admit I hadn't looked in the last few days! Glad to see it back, I certainly go to it often when it is up and running! Thought i'd post this announcement here for those who haven't seen it yet. Sad...…….end of an era. Oh no!! I just looked at it last night yet, or was it Sunday, forget! Definitely will miss the best site ever in all of the years regarding great truck content and great history along with modern day. It was a fantastic way to see the wonderful collections that those that took the pictures shared over the years!! Hopefully we can enjoy the Forum yet as it too has been a great way to contact and make friends in all sides of the continent and the world for that matter along with some awesome pictures! A big thank you Hank, an era that will remain in my memory for years to come!! tremely uncommon specimens. Without exageration we can say that we had here a very large part of the trucks and trucking memory. We can find the best and the worst on the web but this site was on the very best side. For me the web is synonym of short-live;, it's the reason when I can I always choose the hard copy of a product. Thank you very much Hank for all those years of high quality offer. All the best for the future.